Unlike urban apartments in a country house, as a rule, enough space for the organization of a bathroom. You can`t restrain yourself when planning the design space, hunting out every square meter, but realize all conceived concepts and design ideas. Within reason, of course, and the within the confines of the budget for repairs. Apart from the difference in scale, there are peculiarities in the finishing of surfaces, placement of plumbing and decorating the space of a country house. For example, if through the window of your bathroom you see beautiful views of the surrounding countryside, the finishing of bathroom should not detract from the unity with nature and have a neutral, light-colored palette. Closeness to nature pushing designers and homeowners on the use of natural materials in the arrangement of bathrooms in country houses. Only wood can add a feeling of warmth and comfort in an often cool palette of bathrooms and toilets. Wooden beams on the ceiling have not only a constructive function, but also the decorative one. 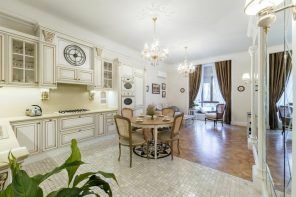 Against the background of bright finishing of the interior, wood in the ceiling, framed mirrors and the space under the sink looks the most advantageous. Even a small wooden bar acts as a stand or stool. Small wooden inclusions in the country-style allowed to dilute the modern style with minimalism, which is the dominant in the interior of the room. The timber can be used as material for the partitions and the open shelves. Practical and rational use of space has created a comfortable, ergonomic area for water treatment. Wooden slats, varnished with lacquer, can finish ceilings, and painted in a neutral light tone – may be the wall covering, in whole or partly. Contrasting combination looks great and raises the overall mood of the room. Sometimes, wood is present in small decorative elements only; in mirror frame, for example. But even such a small natural stroke dilutes monochromatic palette of the bathroom, bringing a drop of individuality. Partial wooden covering of bathroom gives a binding with an unusual design and a touch of the bath, concluding the space in a harmonious wrapping with functional content. Some bathrooms in suburban mansions are spacious enough to organize the whole sets of furniture from storage. 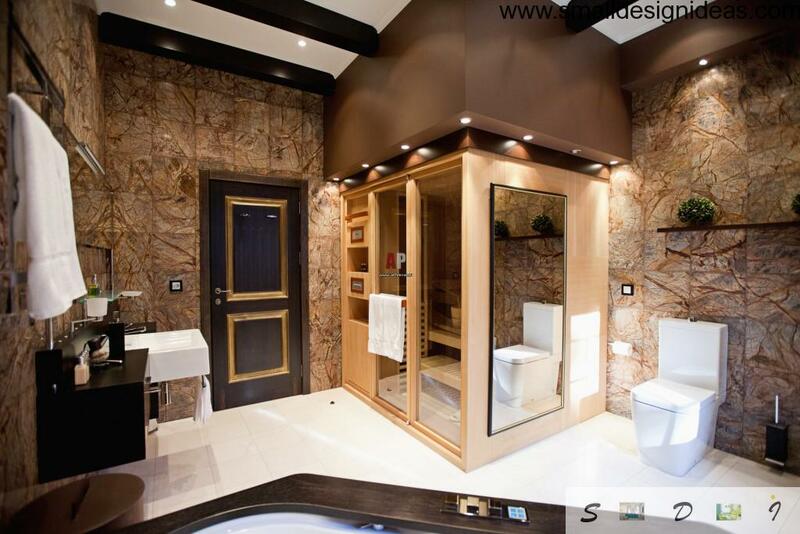 Natural dark wood become the addition of luxury to the interior of bathroom. 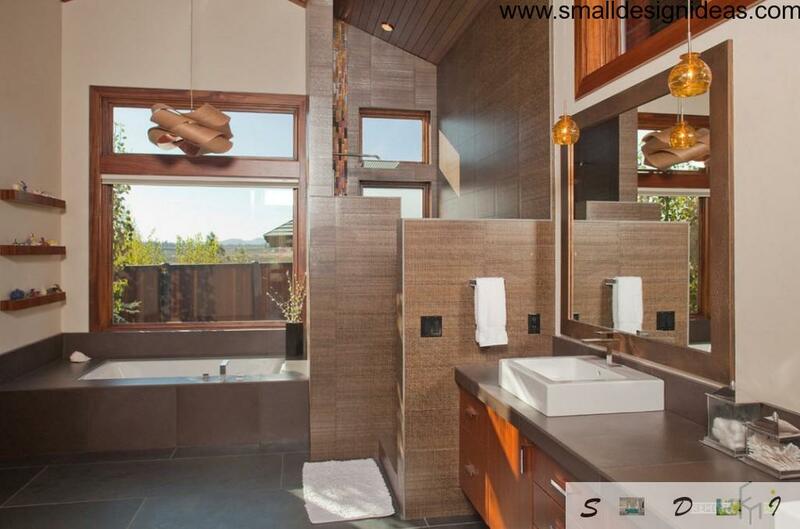 Sometimes with the help of unpainted wood wall paneling veneers all the walls and floors of the bathroom. Against the backdrop of snow-white sanitary ware such finish looks luxurious and will last a long time for country house owners. 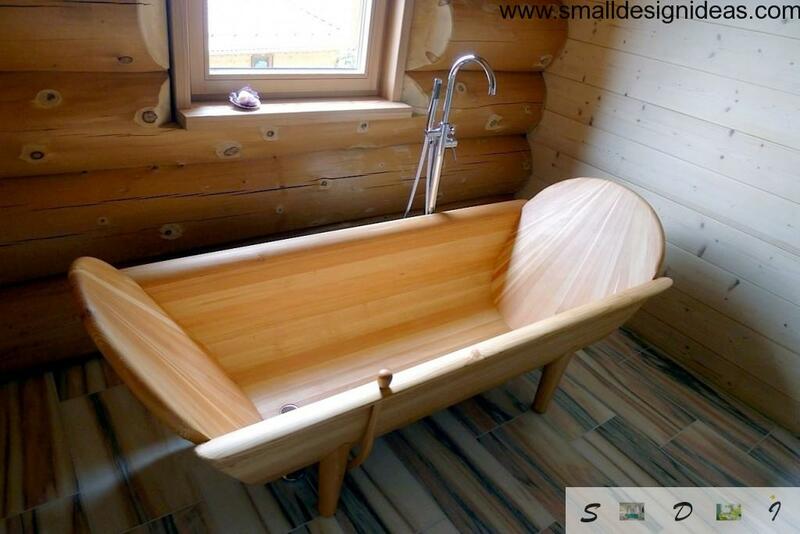 Another version of the application of natural materials in the bathroom or shower room is facing the bath or the creation of it from solid wood. The original, non-trivial design of the room in a minimalist style is remembered for a long time, because is filled with personalized features. Light wood is perfect for lining the small rooms, creating a screen under the bathroom and storage under the sink. The wood can be used exclusively for the flooring. Such design course will make a little bit of natural warmth in cool, snow-white palette of the room for water treatment. By far the most common and practical material for trimming the bathroom surfaces is ceramic or stone tiles. Durability, water resistance, strength and ease of use making tiles favorite among finishing materials for surfaces of rooms with high humidity. 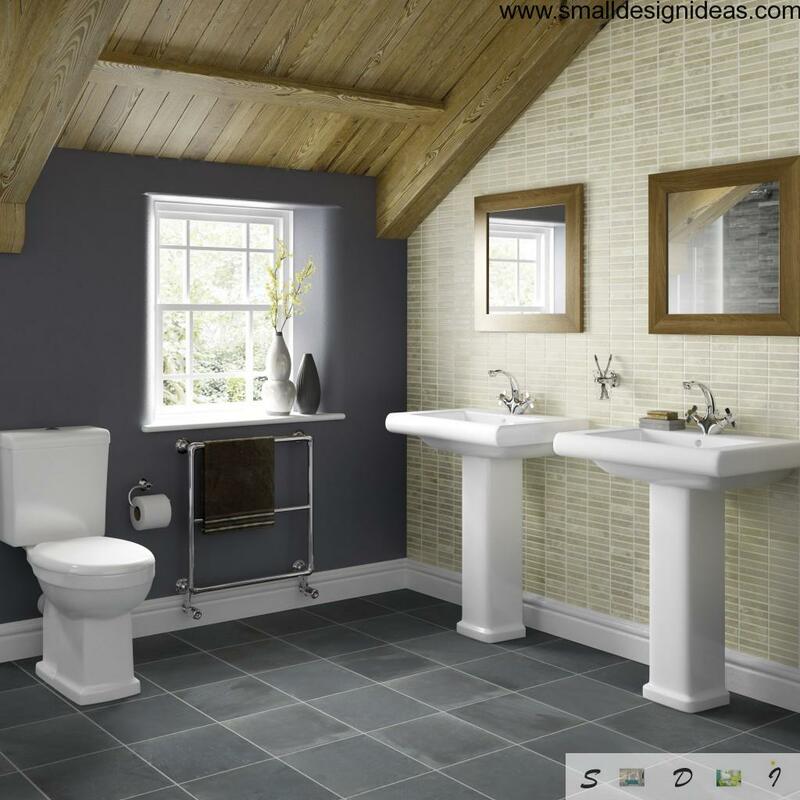 With the help of tiles of different colors, textures, shapes and sizes, you can create a variety of bathroom interiors. 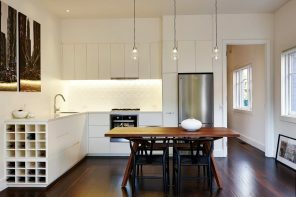 Ceramic or mosaic tiles on the walls, granite floor, marble for worktops and sinks and shower trim – the mass of options. 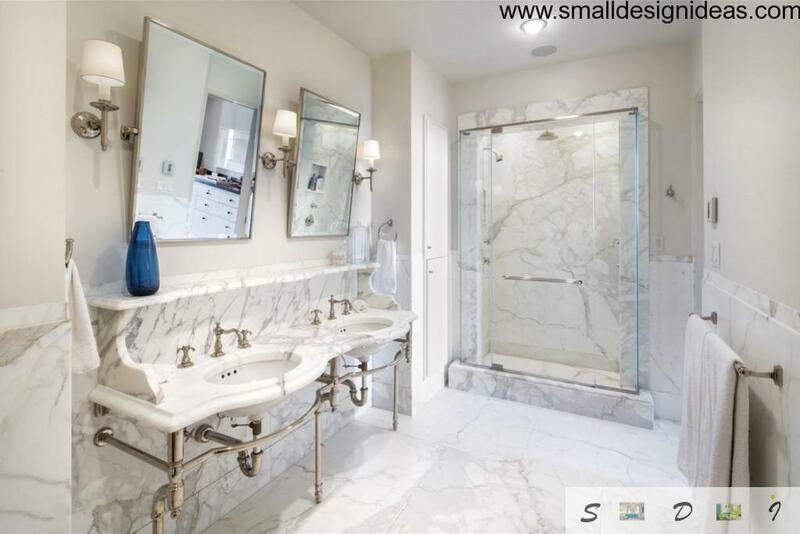 Ceramic tile with the picture will make one of the bathroom walls accent and diversify finishing of the premises, bring a touch of elegance and style. Tile warm wood tones create an incredibly comfortable and luxurious atmosphere in bathroom with interesting decorative elements and design chandelier. You can not only coat the surfaces or their parts via mosaic tile, but also to distinguish certain zones in the bathroom, to make out a niche and bay windows, arched openings and space near the mirror. 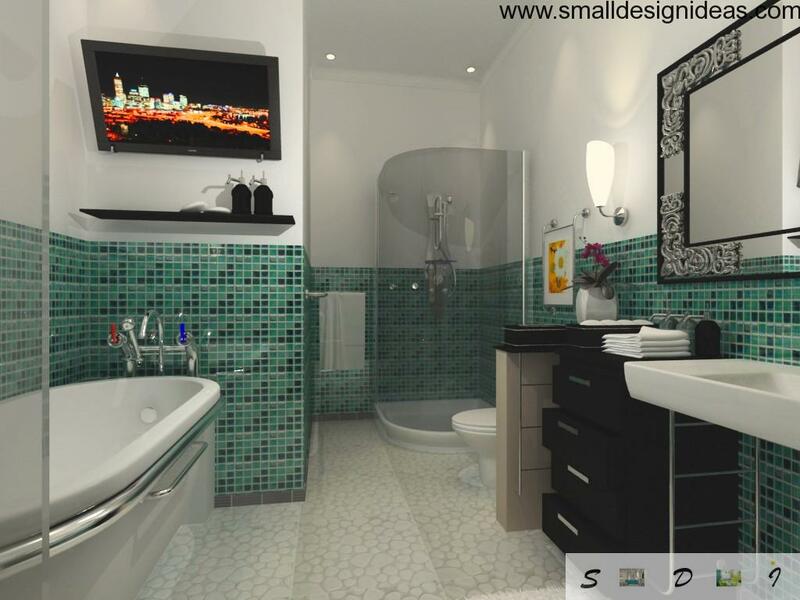 Mosaic tiles with turquoise shades has perfectly diluted snow-white palette of the room. Mosaic tiles in neutral shades made facing of the shower surfaces. 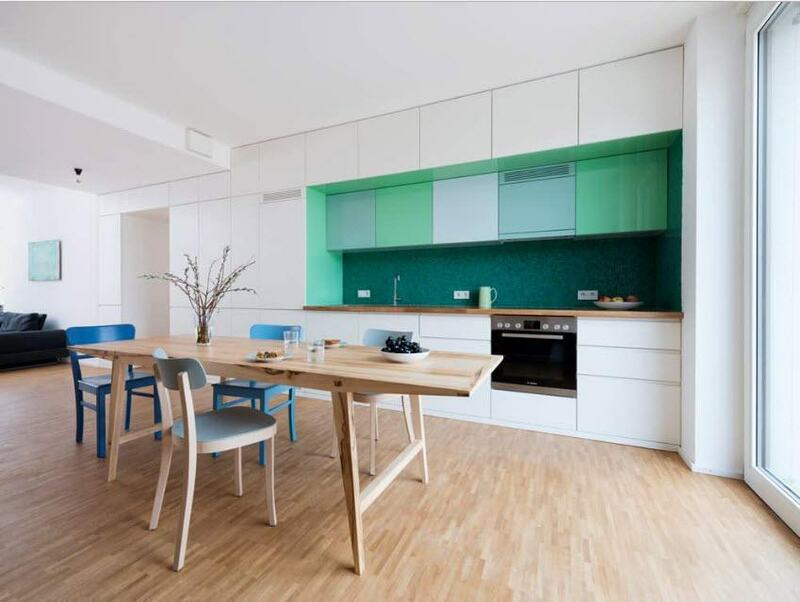 The same palette was repeated in the ceramic tiles for vertical surfaces and ceramic floor covering. Mosaic tiles is advantageous for coating the surface of the small area between the sink and mirrors, paving the color bridge between the dark shades of storage shelves and light walls. Tile in large blocks mosaic groups can be used for floors in the bathroom and shower. This is a simple and effective way of finishing. With mosaic tile can create something similar to the mural to decorate the space of the shower cabin. Neat selection of shades creates a harmonious and stylish ambience of the room. Also mosaic tile is great for edging decoration, emphasizing the space and differentiating it. About the popularity of this type of ceramic and stone tile that looks like brickwork is needless to say. 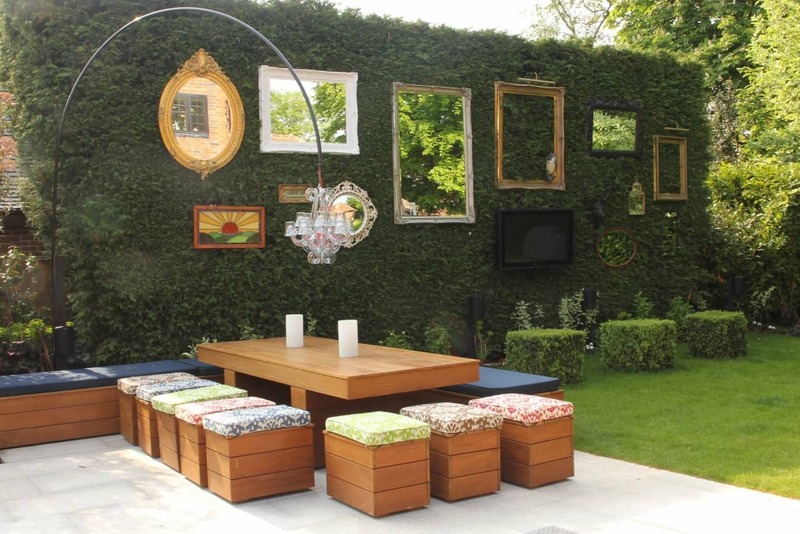 Practical, aesthetic and pleasant to look at a way to wall decoration is used around the world and US is no exception. Tiles “metro” made finishing the shower space, the remaining surface of the walls are covered with painted in white color wood paneling. What is very much in the spirit of the country’s interior, not less than contrasting wooden beams. Snow-white variant of “underground” or “hog” tile looks luxurious and canonical as always. Dark grout between the tile surfaces blends with window frames and rack for towels. This version of tiles as well as possible approached to the unusual shape of bath and niches with illumination on the walls. Live plants supplemented organic image of the room. 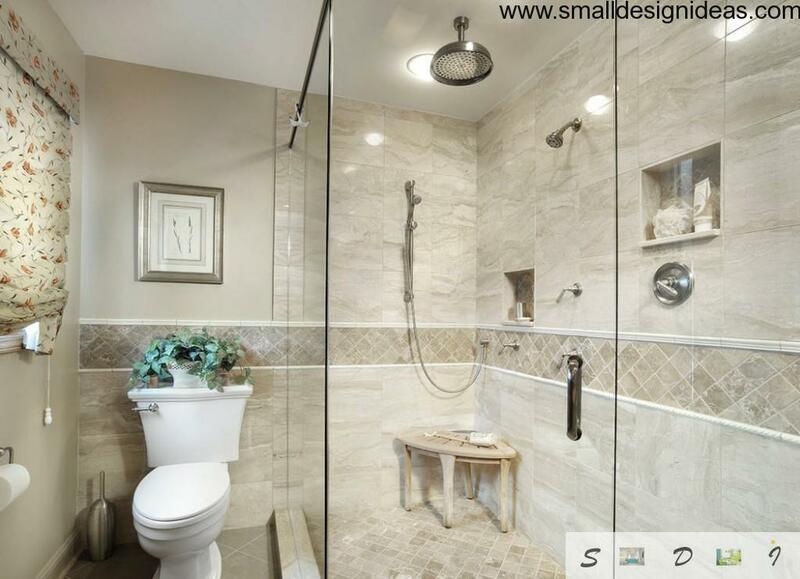 Traditional facing of space near the shower, combined with a bath, goes well with dark furniture set for the bathroom. Dark colors of flooring, mosaic tiles on the floor in the shower and the bath grounds are shaded in the grout between the “metro” tiles. Certainly, the use of the natural stone as a finishing material is not cheap pleasure, especially in the case of the marble. But to find more durable, strong, wear-resistant and incredibly beautiful material is difficult. Modern technology has reached virtually identical to their natural analogue of artificial stone production of all colors and shapes. Most likely, no one but only you will know whether the natural material is used or its surrogate, along with specialists in this field. As a rule, for bathrooms` facing is used light shades of marble with subtle veins. Especially popular Carrara breed, but such materials will certainly require substantial financial costs. Marble with bright grayish streaks was used for cladding of niche space for baths and showers. Material obviously decorated snow-white bathroom. Marble is ideal to achieve the most durable and beautiful countertop for sinks. To underscore the uniqueness of the used material, it would be better if all the other surfaces near the marble will be plain and neutral. Wallpaper in the bathroom: why not? Modern technologies allow to choose waterproof wallpaper for bathroom walls of various colors and shades. Homeowners often choose low-key options in a calm color palette. Try to avoid wallpapering near bathtubs and sinks combining surface treatment with ceramic tiles or natural stone. Floral pattern on the wallpaper brings some variety in the range of bright spacious bathroom, combined with snow-white furniture and sanitary engineering interior looks a little French, Provençal. With discreet neutral wallpaper you can finish one accent wall, it will ease an atmosphere of room for water treatment. 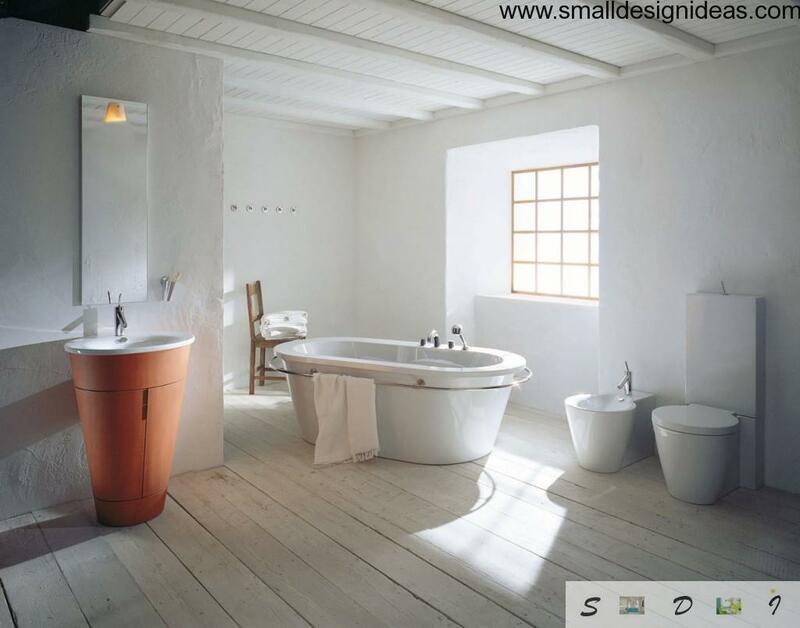 It often happens that designers choose one large or several small decorative items for the bathroom, performed in a neutral color palette, not only in order to dilute the mood, but also to “flip” the entire design space. Such element can be a window of an unusual rounded form or upper light in the suspended ceiling in creative design. 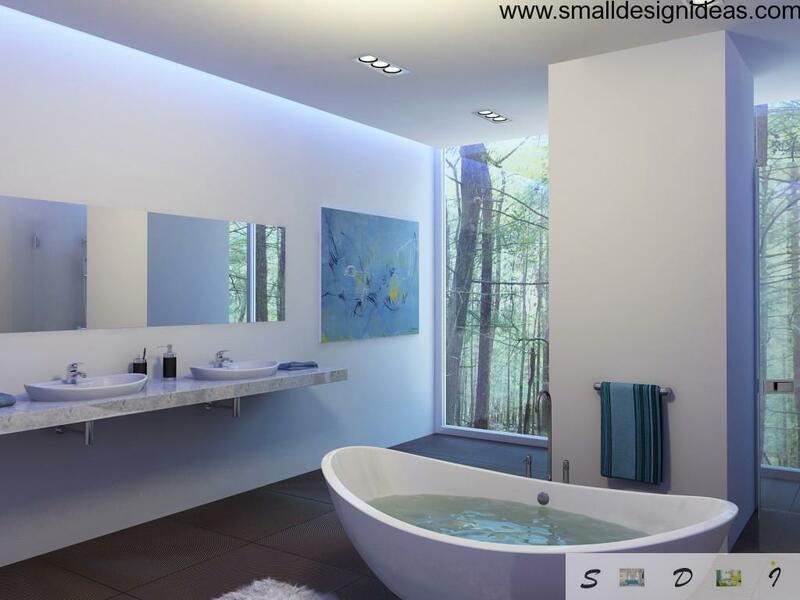 In this light, at first glance, bathroom a lot of interesting colors are in harmony with each other. These decorations can become works of art in bright, contrasting frames. A white trim walls will be an excellent backdrop for the disclosure of all color paintings. 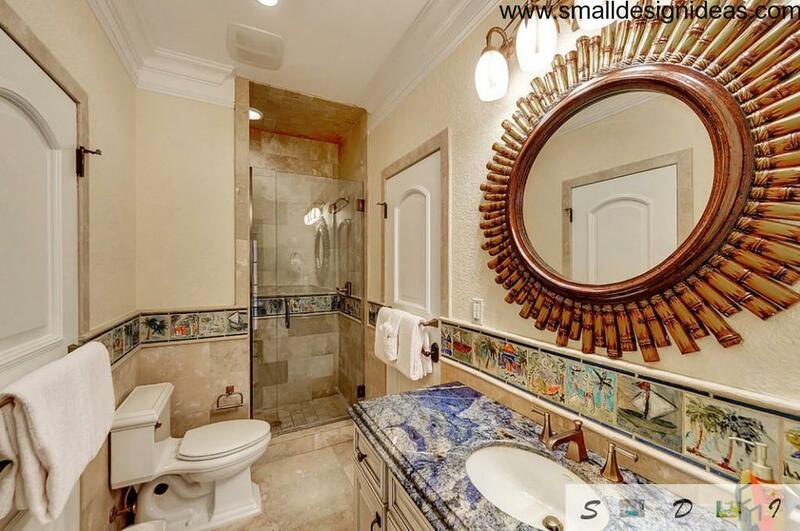 There are a lot of interesting original decor in this bathroom: mirror frame decorated of shells, decoartive plant near the mirror, original lighting and contrasting plastic sink countertop. As original feature can be considered very large chandelier of unusual design or huge natural flower in a pot in the form of a wicker basket. The interior looks fresh and interesting, colorful and comfortable. Bright and original frame for a mirror made of bamboo to match the drawings on the tiles, which is performing the rim between the sink and the wall. 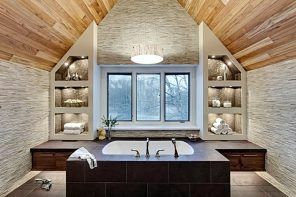 Stone countertops with bluish veins have finished an extraordinary image of a bathroom.